In view of our coming church anniversary and Yuletide Season, we have decided to spruce up the church by repainting its interior and exterior. The colors chosen were in shades of cream, sandy beige, mahogany brown and black. The church is now very much in order except for the table right up in front side aisle. 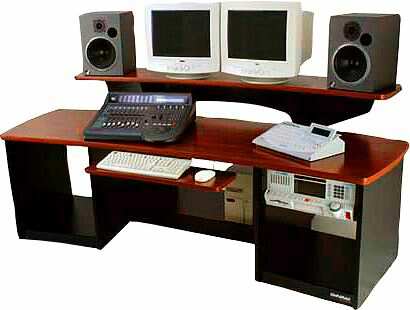 This regular table holds the mixer, computers and monitors for the church's sound and video system. It certainly looks "sorry" enough that I have suggested that we need an omnirax force 12 workstation to hold all our video and sound system gadgets. I wonder how much it costs?